Award-winning, and nationally recognized, Prull Custom Builders, has been selected as a premier preferred builder to represent the essence of the unique and expansive terrain of Las Campanas. Over the past 38 years, the company has and continues to build architect designed homes throughout Santa Fe, forging strong relationships with the best architects, interior designers and artisans. Their clients rely on their expertise and extensive network of adept building professionals to create the finest homes possible. THE RIGHT PEOPLE TO HELP YOU FIND THE RIGHT HOME. Find the home or homesite you desire with the assistance of Las Campanas Realty, located on Camino la Tierra, at the entrance to Las Campanas. Las Campanas Realty, and its experienced team, will take the time to welcome you to find the perfect home site that will be the ideal fit for your lifestyle. Its part of their commitment to the community of Las Campanas. The full-service brokerage’s state-of-the-art sales office, designed to welcome visitors and offer expertise on all things Las Campanas, is open 7 days a week, providing information and material essential to exploring Las Campanas. The office includes a large, touch-screen topographical table and a comprehensive printed map of the development to identify every lot by gated neighborhood and number. If you’d like to learn more about Las Campanas or arrange a tour, please stop by or call. NEIGHBORHOODS OFFER STUNNING VIEWS OF THE SURROUNDING MOUNTAINS. Pinon pines and crystalline skies, which have enticed residents from around the country, bring the pleasures of nature home. Every neighborhood has its own personality and is unique in its own right. BLACK MESA NEIGHBORHOOD, which Las Campanas Realty developed and released in the fall of 2017. This was the first new neighborhood introduced within Las Campanas in over a decade. It continues to see success with just under 70% of the neighborhood sold out in less than 16 months, with several custom homes under construction. 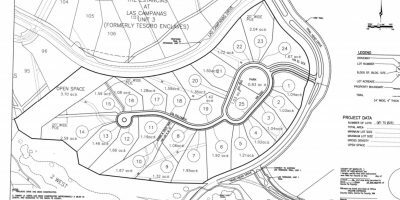 The development consists of 44 acres, with sites ranging from 1.02 to 2.58 acres. The attractiveness of Black Mesa is the ability to be close to the club while also taking advantage of the exceptional New Mexico mountain views. 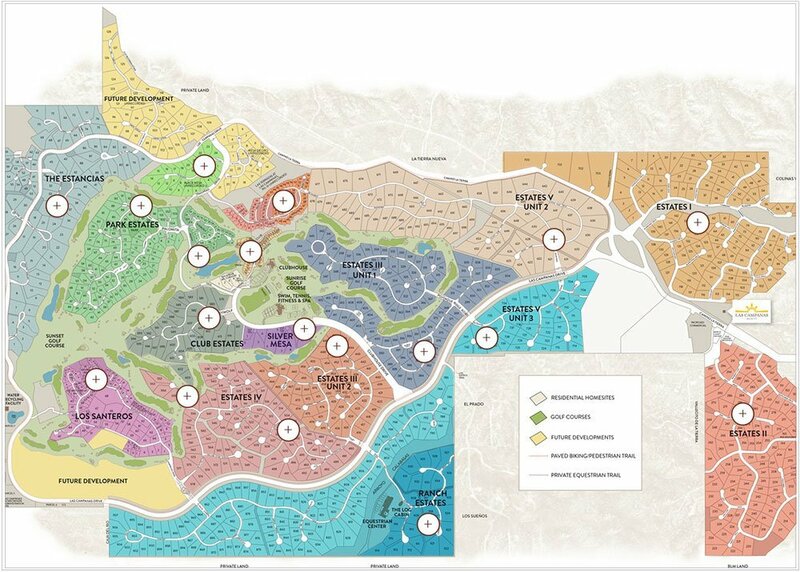 LAS TESORO ENCLAVE, the newest neighborhood, and considered the most desirable piece of land in all of Las Campanas, will offer 37 home sites spread over 117 acres, with sites ranging from 1.5 to 6 acres. The majority of the lots provide wraparound views, taking in both the Sangre de Cristo and Jemez mountain ranges, along with the Ortiz and the Sandia’s in the distance. A good portion of the Enclave directly backs up to 68,000 acres of land protected by the Bureau of Land Management (BLM), with views unmatched in Santa Fe. Properties backing up to the BLM will allow stables, enabling easy access to open land for equine enjoyment. Las Tesoro Enclave will be releasing sites for purchase on September 6, 2019. In the interim, Las Campanas Realty will be accepting reservations starting February 15, 2019. A ‘must see’ to consider your next residence!